Experience the atmosphere, the character and the tradition of a hotel dedicated to well-being. Located next to the cosmopolitan Avenida da Liberdade, its eyes set on the botanical gardens, is the classical Hotel Lisboa Plaza, an icon of hospitality and heritage in the city of Lisbon. Inaugurated in 1954 as the Hotel Condestável, its history is linked to the unforgettable and attractive Parque Mayer, the stage for entertainment in a Lisbon of yore that contributed to this avenue being internationally recognized. The increase in the number of tourists visiting its cafés, theatres and houses of “fado”, motivated the construction of this high quality hotel. Lucínio Cruz was in charge of the architectural project and strove to promote the modernity and well-being of the guests in an innovative fashion. The façade is austere with an international style. The enveloping spaces are full of charm and comfort thanks to the classical design conceived by Graça Viterbo and the attention given to all the details. The hotel maintains its character, harmoniously combining the tradition of its history with the demands of modern times in a spirit of great versatility. The Hotel Lisboa Plaza is the ideal harbour to return to for a rest in its comforting rooms and to experience its family ambiance after uncovering the city’s well-kept secrets. - Late check-out (until 14h). - Free entrance in the National Museum of Ancient Art. Located next to Avenida da Liberdade, in the historical centre of Lisbon. "The decor of this hotel is by the Portuguese interior designer, Graça Viterbo." "It's been in business for more than 40 years, and the experience shines through every aspect of its operation." "In the heart of the city, is a charmer." "Delightful, friendly hotel in a fabulous location… just steps from the Avenida Liberdade, Lisbon's premier promenade." 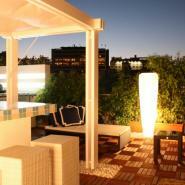 "This impeccably maintained hotel is conveniently located just off the Avenida da Liberdade." "This bright, polished, family-owned hotel is a real treat." "The city's main attractions are all within easy reach and whenever you want you can slip back into the Plaza's calm." "Combines modern comforts with traditional charm."